We were recently contacted by Hugh Fairlie with the following inquiry. My name is Hugh Fairlie, I am a GP in Cornwall, and am the son of Hugh, the late Director of Education of Renfrewshire, and descended therefore from Hugh who was the Provost of Maybole at one time. He must have been my great Grandfather, and my Grandfather was Tom Fairlie, who lived in Ayr and who was a Baker. I have a family heirloom, a fob watch which was presented to the Provost Hugh, by the people of Maybole and District, Hamilton, Canada. I wondered if there was any record of an official visit by him, during his term in office, which might relate to this? If there are there any of our website visitor that can answer this question please contact us so that we may solve this little mystery. Photo of inscription. Do you know the history of this Medal? It celebrates the coronation of the present Queen’s father in 1937 Perhaps every child got one as it has Maybole on the back. Contributed by Isobel Seymour. "Found this wee card from 1903. I recognise a few names, but I wish I could read the hand-written bits better. They obviously didn't know who was going to perform the songs or recitation until after the print was in, so someone has written in the performers. Maybe the last song was never performed." Isobel Seymour found this old Royal Bank of Scotland, Maybole Branch Cheque in her personal archives and thought it appropriate to post here with the celebration of the bank's 150 anniversary. She wonders if any of our site visitors know who E. Cathcart might be. Update! We may have found an E. Cathcart! ..And now another! School meeting minutes and entries for 30 pupils. This school was for the purpose of removing as many waifs and strays from the streets of the town as finances would allow and to educate them in the "4 R's". Reading, writing, arithmetic and religion. These intriguing accounts read more like those of a "reform school" than for normal students. I was recently doing some work in my flat in Seaton Street (The Foresters Building) and came across a screw top bottle in the eaves! The label I found was not on the bottle but was nearby. The label is for Guinness's Extra Stout , and bottled by Turner's Breweries Ltd and has DUBLIN on the bottom of the label , I am trying to find out more about it . The brewery is on the label and it states TURNER'S BREWERIES Ltd , AYR & MAYBOLE , can anyone shed any light on this? Kirkmichael Road was formerly known as the "Cottage Road" because it led to the Cottage of St. Johns. The lands on which St. John's Cottage now stands was formerly known as "Bogend". Transcription contributed by David Killicoat. Kirkbride Kirkyard surrounds the ruins of Kirkbride Church. This burial ground over looks the cliffs of Dunure and Fifth of Clyde in South Ayrshire and is located a few miles northwest of Maybole. Located in a cattle field, the cemetery is not maintained and has sadly deteriorated over time. 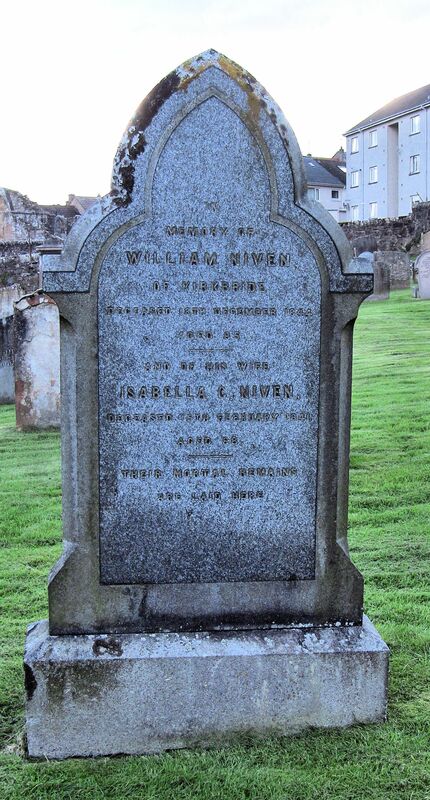 In an effort to preserve something of these monuments David Killicoat has, with the assistance of other members of the Maybole Historical Society, recorded in photographs and transcriptions what remains today of the kirkyard. 1ST AYRSHIRE VOLUNTEER BATTALION - MAYBOLE COMPANY MUSTER ROLL This volunteer unit was formed in Maybole in the early 1900's as part of the Volunteer Force of 1914 -1918. This remarkable set of documents was recently brought to light by Andy Connelly, a local plumber. He does not recall how these unique records came into his possession but has generously contributed them for display here. The muster roll of six double pages contains approximately 160 male names with year of birth, occupation, address and other notes. This old cemetery contains many interesting tombstones. It is estimated that over 20,000 people are buried in this small area which barely contains an acre of ground. There are 192 monuments cataloged in complete detail here, including a surname index and map with the location of each entry. WORLD WAR II SCROLLS OF APPRECIATION. "For five years the old town survived a period of food and clothes rationing, blackouts, air raid warnings and other alarms until its men returned from the wars in 1945... Scrolls were prepared conveying the thanks of the people of Maybole for the services given to the nation by the serving men and women and each returning combatant was given a scroll with a gift of £4 in cash. In all 747 serving men and women received such scrolls and cash gifts while 29 war widows also received similar scrolls and gifts." From James T. Gray's book - Maybole, Carrick's Capital. In 1690, in an attempt to pay back monies advanced to them by the Shires and Burghs, and to reduce the arrears of the army, the Parliament of Scotland granted a tax of 14 shillings on each hearth in Scotland....In general terms, the historical value of the rolls is that they provide the fullest list of people before the censuses of the nineteenth century. Follow the link above to view the list for the Parish of Maybole. LETTER - REV. MR. JOHN RAMSAY, KIRKMICHAEL, NEAR MAYBOLE. This letter, dated 8th August 1797, is addressed to the Rev. Mr. John Ramsay, Minister of the Gospel, Kirkmichael, Near --- Maybole. The disposition of the estate and children of a Mr. Walker are the main subject but the writer, David McClure, appears to have as been a personal friend of Rev. Ramsay as well as a former resident of the town. Click on the image to the left or the link above to view full pages of the letter and a transcription. KIRKOSWALD KIRK SESSION RECORDS 1812-1860. Kirkoswald Parish lies just south of Maybole Parish and included many individuals and families with connections to Maybole. These session records include rolls of Communicants, contributors to aid the poor, a population survey, the account of an abandoned infant and case of a child's murder. Transcribed by Ann Nicholson. 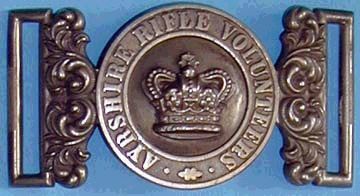 In 1919 those who came back from the great war were entertained in the Town Hall, all were given medals from the townspeople with the Town Coat of Arms on one side and inscribed with their names on the other and the men who had won special distinction for their bravery were gifted gold watches. "In 1887 when the new Town Hall was built on the site of the old jail the members of both lodges in the town were again out in full strength to ensure that the operative masons laid the foundations to the satisfaction of their speculative brethren and no doubt the "founding pints" would be issued freely at the harmonies 'which always followed such outings. In 1905 the foundation stone of the Carnegie Library was laid with full masonic honours in the presence of the Magistrates and Town Council before a large gathering of townsfolk" From James T. Gray's book - Maybole, Carrick Capital. Click here to view the pages of the ceremonies for laying the foundation stones. Searchable list of names on the War Memorials about Maybole and area including some with photographs. Complied and contributed by David Hunter. James McKnight's 1756 publication Harmony of the Four Gospels. (Maybole Old Church Minister 1753-1769) Subscribers names in eighteenth century books give an insight into the lifestyles of the inhabitants of towns of the period, occasionally listing their trades or professions. Extensive listing of archive records for the Parish of Maybole and some parts of the Parishes of Kirkmichael, Straiton and Kirkoswald as compiled by David Killicoat. Index of some Carrick churchyards and cemeteries . Transcription of the 1837 Pigot directory and images of the pages of the 1851, 1883 and directories for Maybole. Transcriptions and page images for lists of contributors to Maybole Old Church. Includes names of individuals, street of residence and contribution amount. Here is a list of the Family History Library (FHL) films and fiche numbers covering Maybole census returns, parish registers and indexes. Go to the Family Search website for more information on how to order films through a local FHL centre. Here's a link to the 1845 Statistical Accounts. Find Ayrshire and then select Maybole for a very detailed account of Maybole Parish by Rev. George Gray, Minister of Old Maybole Church.